Hart’s Landing is Sarasota’s oldest saltwater fishing bait and tackle store. 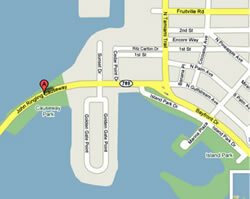 We are located near beautiful downtown Sarasota at the foot of the John Ringling Causeway on the way to Lido Beach. We offer a variety of live and frozen bait for saltwater fishing in the Sarasota’s bays and in the Gulf of Mexico. We are accessible by car or come up in your boat and tie off at our dock. Our rustic building is a piece of “Old Florida” amongst the downtown Sarasota condominium skyline. Our specialty is live saltwater fishing bait, tackle, and our knowledgeable staff can get you geared up for a great day’s fishing on our beautiful Sarasota waters. We are next to the largest fishing pier in Sarasota County. The T.J. “Tony” Saprito Fishing Pier is a free fishing pier that has been known to provide hours of good saltwater fishing. We are situated in a park like setting with plenty of good fishing along the seawall and sidewalks between Hart’s Landing and the Saprito Pier. There are plenty of benches and a quaint gazebo for your enjoyment and relaxation. Public restrooms are available in our facility. How to find Hart's Landing? Hart's Landing is located under the Ringling Bridge.